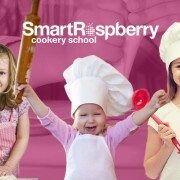 Our cookery school was set up with one thing in mind – inspiring children to cook healthy, delicious food from scratch. Our team is made up of people passionate about food and cooking, who take the task of teaching the next generation a vital life skill very seriously, but we are by no means very serious people. Cooking should be fun, especially for children and we LOVE to share our enthusiasm with them. So we run cookery parties, clubs and classes during term time and workshops in the school holidays, Duke of Edinburgh courses and lots more. We teach basic cooking skills and inspiring an interest in food among children as young as 5 years old up to teenagers in their first years away from home. We aim to introduce our students to a wide range of ingredients, encouraging them to try new things, and to provide them with the confidence to cook independently. The sense of achievement to be gained from cooking something from scratch is not to be underestimated.